One dietary challenge for me is eating enough vegetables. Meat and other proteins (eggs, fish, poultry) are easy as they are quick and satiating. 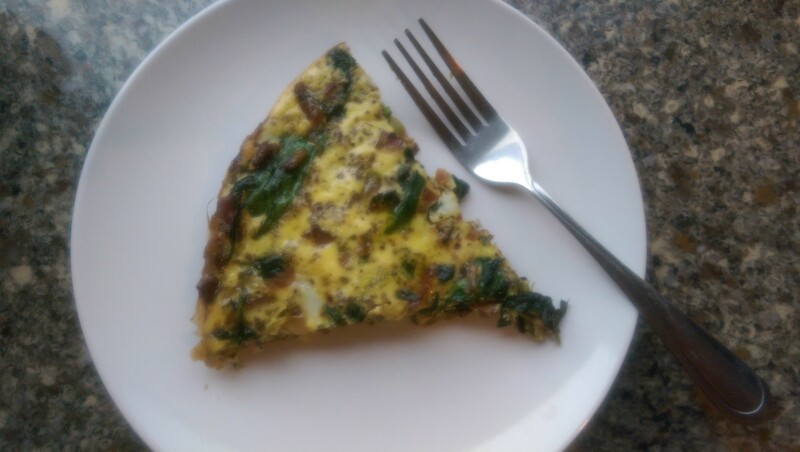 I have come up with a few ways to sneak more greens like spinach, kale and broccoli into my everyday eating and the frittata is one of them. I like frittata’s not only because my granddaughter calls them “tata’s”, but because they are quick and easy to make. I use my cast iron skillet to sauté the meat in veggies in before I pour the eggs over the top and slip it into the oven. Easy one pan nutritious breakfast. Here is the recipe without amounts, because I want you to exercise your intuitive cooking abilities. You do have them. Flex those cooking muscles and experiment! Breakfast meat of your choosing chopped. I like bacon and some kind of sausage. Cut and cook in your oven proof pan. Onion, garlic, kale, spinach and broccoli. Cut in small pieces and sauté with the cooked meat until tender. Scramble your eggs with salt and pepper and dried herbs and pour over the evenly distributed meat and veggies. Bake in the over at 325 degrees for 20 minutes. These keep well and can be made ahead and pulled out as a quick leftover meal when you are in a rush. You can cut up and freeze if you want to do a large batch. Previous Previous post: Homemade Mayonaise- It’s a Real Food Life must!